Oh, I really love the Dawn colors! Can't wait to find a way to use it. Oooh I love the fabrics! Great colors! OOOh!! I love it!!! I can for sure see some pillows in my living room in Dusk Tulip or Dawn Picket. LOVELY!!! Love, love, LOVE!! (But you already knew that, since I was privileged to get a sneak peek. It's great being your mom, y'know. ;) ) Can't wait to be able to sew something from them! Well, orange is my favorite color. But that dusk colorway is totally rocking my socks. I LOVE it! Really beautiful! love the frond and tulip. I bought the needle shop groupon a few months ago and think I may be overwhelmed when I get there! Love these mid-century looking designs! love love love love love it, Jessica!!!! great work, how rewarding to see it complete! Congratulations! What creativity, and what an achievement. I absolutely love Skiff and Frond in the Dawn colorway... I need them! I'm designing my soon-to-be-here baby boy's nursery in aqua and (you guessed it) orange, so those colors are spot-on for my project. I see book slings and chair cushions in these fabrics in my future! Based on the name, I assume this is outdoor-safe fabric? These would make some gorgeous patio chair cushions. Oh, Jess--this is gorgeous! I'm looking forward to ordering some. Yes, please do let us know when they'll be available for retail purchase. I have a similar chair to what is shown in the first pic, and I would LOVE to slipcover it in one of those fabrics! oh, exciting! i love the dawn wildflower print! These are gorgeous and amazing. I love them! LOVE!! Love love love love love! Congrats; they are beautiful!! Congratulations. This is great! Did you mention it to the lady who runs the True Up fabric blog? I think she'd be itnerested. Lovely! I'm such a big fan - don't stop designing fabric please!! Beautiful! I like them both but the dawn colors would be perfect for my home. Great designs I like the dusk color way especially and my favorites patterns would be Frond and Picket. So lovely. Man, you guys need to stop designing cool fabric. I'm going to have to sell a kid. Beautiful! I especially love the dusk colorway! WOW...on so many levels! Your newest fabrics are so beautiful. Also, must mention that it just warms my heart that your mum leaves such wonderful comments here for you. It's clearly a very special bond that you share and it's a privilege to bear witness to it. I have a 4yo daughter and aspire to sonething equally special as she grows. I'm sure it won't be very long till we see this lovely fabric all over the place as well! Oh i love the new collection! Actually yesterday i went to JoAnnes to try and find a good grey and yellow fabric for my office remodel and i couldnt find a thing! I might just be in love with Picket in your dusk collection! Congratulations! I really like both skiff and frond! Congratulations!! The collection is amazing!! Gorgeous! I love the orange and teal, refreshing. absolutely stunning, love all of it! i just saw your new line on True Up...congratulations! it's wonderful and i can't wait until it's available for purchase!! Oh! They are super cute! 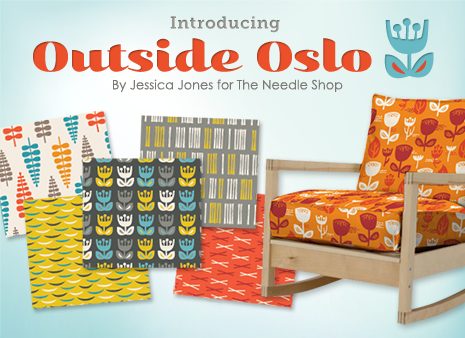 As someone born is Oslo, I love these fabrics. I really love Skiff and Tulip in both colorways and Frond in the dawn colorway! I can't decide if I like the dawn or dusk better... I just want it all and I'm going to have a hard time waiting till May. Congratulations! I love these fabrics. Both colorways are great, but Dawn takes the cake! These look really great - well done on the launch! Way to rock some fabric! Congrats and I hope you sell yards and yards and yards and yards and then some more yards. Wow HELLO awesomeness!!! Can't wait to hear when and where I can get all of these lovlies!!! Wonderful fabrics! If I could have dream patterns, those would be them. Love, love, love the Dawn colors! Congratulations! I love the designs and the colors of the fabrics! What can I say. I love orange and I love Oslo. But I'm really curious why you chose that name for the collection. Excellent! I relly like the trees and the flowers. Can't decide whether I prefer the dusk or dawn colours. Both are great! Oh my god ! They are so nice ! I love the Dawn colors, especially "Wild Flowers". Are you serious? My great-grandfather came straight off the boat from Norway. This fabric line is so me. This is why I love you. This is a simply gorgeous line - I love all the colourways ... I'd already bookmarked it on another blog before I realised it was YOU!!! ack! these are gorgeous! and I am sure they will end up a Target chair one day! So beautiful! I'm in love and can't wait until they're available to purchase. I have actually been looking for modern awesome prints in the Dusk colorway, too bad it is coming out about 2 weeks too late for my use. They're beautiful! Both colorways look great, can't decide which one I like best! Everyone, thanks for your super compliments! It's always a little scary showing new stuff. I had imagined a scene where my mom left the only comment, and she said, "Well, I don't care for it much, but I love you anyway." You guys are making my day! I'll share more about the names and stuff in a future post. Have a good weekend! They look really great. Congratulations Jessica! 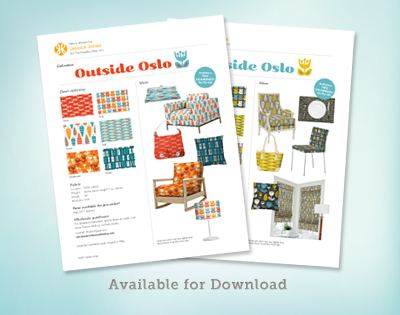 I am so excited - the patterns are gorgeous (I'm Norwegian and therefore hardwired to love everything Scandinavian) and my favorite fabric shop is involved? I'm going to buy a million yards! This may well be the most wonderful selection of fabrics I have seen! I love it! These are gorgeous! Love the dusk colors. Great work, as usual! Oh my gosh! Jessica, I absolutely love it! So happy for you. Love the line! I can't wait to buy it at the needle shop! I just saw you featured on Print & Pattern, a site I just discovered somehow on the interweb. And so fast they've discovered you. Just as I suspected, you're everywhere! Can't wait to see these hit the shelves! These prints (and you) are AMAZING! They are so great, I especially love the Frond pattern! Jess, I LOVE this collection! And I'm not a print girl. Thank you for having it all come out in home dec weight. YES! Well, clearly you are awesome. Those colors speak to me! But I'm especially digging the dusk right now. Congratulations! Love the look, love the name. Luv! Congrats... job well done!!! Beautiful! I'm excited for May! I certainly understand that the Dawn color palate is very Outside Oslo. However, I think the Dusk array is more Inside Oslo, muted colors and rather concrete junglish. I'm just sayin'. If you need a test driver in Norway I'm your girl! Outside Oslo is positively gorgeous. I want to make something out of it right now! I can't wait to get my hands on some. I LOVE them!!!! I want a chair with the Frond from the Dawn collection in my living room... but really, I love them all! Congratulations on this great achievement!!! I love this collection even more than your first....and that's a lot. I cannot wait to get my hands on this fabric! oh no...how am i going to stop myself from buying the entire dusk range...my fave colours all together...new curtains, upholstery, bedspread....heck, why stop there, new dress, bag...yum yum yummy! Hello dawn colorway picket! I suer love your print and vibrant color. Shades of turquoise are really great. Absolutely gorgeous! Especially the Dawn wildflower. Why Oslo? so excited for you! oh to be a textile designer.....maybe some day! loving the new line! congrats! when you first posted your fabrics years ago, i wanted a yellow and gray pattern so badly! i'm thrilled to see it's finally here! thank you! congrats! those are awesome and i can't wait until i can buy all of them!! Holly Canoli! These designs are awesome! Those designs are soooooo beautiful!!! I saw your lovely fabrics on True Up the other day and it was love at first sight! Gorgeous. I am hoping someone in the UK is going to stock them. omg! I have been looking for cute grey and yellow fabric my whole life! Best color combo ever! Thank you! thank you! Thank you! J'adore! The dusk colourway is so beautiful. I LOVE your blog and fabric designs and am anxiously awaiting the day when I can order!